We offer many types of Urethane products. Urethane has many valuable qualities including its resistance to wear, abrasion, solvents, cuts, and tearing. Urethane can be cast, molded, or machined to tight tolerances. It can be made to any point on the durometer scale from very soft to rock hard, including dual durometer parts. Urethane is available in a wide variety of colors. We specialize in covering rollers with various urethane compounds and hardnesses depending on the application. These include drive rollers, coater, idler, pinch, paint and more. We also cover many types and sizes of guide and pulley wheels. We stock 85 durometer red urethane sheet in thicknesses from 1/16″ to 1/4″. Urethane is the product of choice for many custom fabricated parts where wear and abrasion resistance is required. 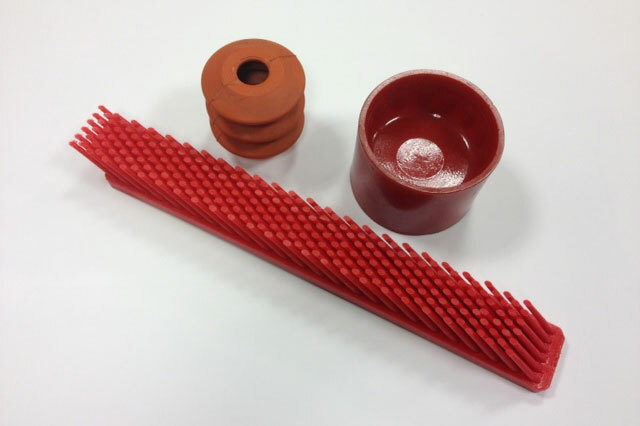 We can provide molded rubber parts to your specifications. Neoprene, Nitrile, EPDM, Viton, Silicone, Natural Rubber, and more. Compounds certified to Military specifications and FDA standards are available. Introducing FSD nylon zytel 101 molded bolt insulation bushing for welding fixtures. We stock several FSD parts including FSD-15057, FSD-15058, FSD-15135 insulator bushings. We also have inventory on the FSD-5555 and FSD-5919 Flash Shields. Mushroom Knobs in varying sizes are on the shelf including FSD-9213, FSD-9213A, and FSD-9214.